Casa Encantada is a modern restaurant offering International cuisine. The average price of a main course dish at the Casa Encantada restaurant is 15 euros. The average price of a 3-course meal at the Casa Encantada restaurant is 30 euros. Note that although GoMadrid.com strives to maintain all information about Casa Encantada up to date, the prices mentioned are only an indication and may not reflect the exact value of your meal. This restaurant has a very stylish and warm decor, mixing antique furniture with large paintings with an inviting ambience lit by candles. Every last detail is taken care of by the owner, José Manuel Pazos, making sure the client is completely comfortable and satisfied with this dining experience. The cuisine here is proclaimed as 'international fusion' and combines traditional and newer dishes, always with the owner's personal touch. Typical starters include vegetable tortilla, duck magrét and blinis. Meat dishes such a steak tartar and mixed grills are available, together with grilled and baked fish. Absolutely essential to save room for the delicious desserts with a concoction called 'Amor Apasionado' taking pride of place. 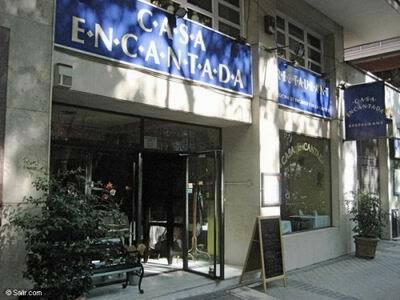 The address of the Casa Encantada restaurant is: Profesor Waksman, 11, 28036 Madrid. The nearest Metro station is Cuzco. Please see the Casa Encantada restaurant location map below.